How does Goji Active Work? The Goji Berry is considered as a wonder fruit used by the Chinese people for over a thousand years to treat ailments like heart palpitations, insomnia, and even chronic fatigue. Today, it is one of the components of Goji Active. This is a supplement that promises not only to help a person shed unwanted pounds, but also to improve liver and immune system functions, strengthen the eyesight, and boost energy levels. Goji Active has six components and the majority of these are stimulants. 1. Each capsule contains 225 mg of green tea extracts, 200 mg of caffeine, and 8 mg of L-Theanine. The stimulants elevate the body’s temperature and cause metabolism to speed up. 2. Goji Active also contains 135 mg of EGCG or epigallocatechingallate. This is another green tea extract that is rich in antioxidants. 3. The 50 mg of Goji Berry also adds to the amount of antioxidants in this weight loss supplement. It lets the body breakdown fat faster. 4. Besides the antioxidant components, each capsule also contains75 mcg of Chromium and 50 mg of Goji Berry. Chromium is a popular mineral in weight loss supplements because it boosts insulin efficiency and raises lean body mass. 1. Looking at the components of Goji Active, any person taking the supplement should experience weight loss within a short period. Why? More than half of its formula is designed to help the body burn fat. 2. Caffeine and green tea also provide extra energy boosts that would allow a person to participate in exercises and physical activities with higher intensities. The more you moves, the more calories you may expect to burn. 3. Besides dropping the unwanted weight, the supplement also provides antioxidants that could help slow down the aging process as well as improve bodily functions. High caffeine content may cause difficulty in sleeping. The goji berry is a great source of antioxidants and vitamins. It also promises an astounding array of benefits including weight loss. •	However, if you read Goji Active’s label, you will see that it contains only 50 mg of the berry. Some Goji Active reviews state that this amount is not enough to warrant a $50 price tag because it is really tantamount to buying other more common berries from any local produce store. Looking at the amounts of the ingredients of this weight loss supplement, one might think that it is really effective as a fat burner because it is composed mainly of caffeine and green tea. •	But, if you add the two up, they will not reach the amount that is required in order to cause any significant loss in weight. So it might be smarter to think twice. •	If you still want to try Goji Actives as a stimulant, be wary of availing the company’s free trial program. This requires enrollment to their auto-shipment program which could be pretty difficult to terminate. I’ve been using Goji Active for more than three years now. I could say that it a great product since it helped me to lose weight especially that I combined it with the proper diet and exercise. 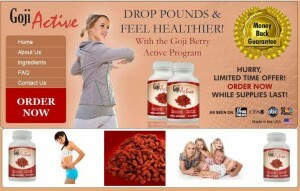 Now that I’ve lost more than ten pounds, I just couldn’t get any happier with Goji Active. I’ve been telling my friends to use it and it just great that some of them already purchased it. As for the sleeplessness, I’ve never felt it actually so I don’t know if I should agree with it. Being a Goji Active user before, it has been actually a disappointment for me. In my case, I wasn’t able to get the result that I was expecting. Goji Active is also expensive so for me, it not really worth it to buy at all. It also caused me some sleeplessness before. So not only that I didn’t shed some pounds, I also got insomnia. It great, right? So if you don’t want to experience the same thing, stay away from this product. My Goji Active experience wasn’t that remarkable at all. When I bought this product, my expectations were quite high since goji berries were getting popular that time. I used to think that I?ll be able to drop off around 10 to 15 lbs within 2 to 3 weeks since my sister?s wedding was already getting nearer. But to my dismay, I just spent my money for nothing. I wasn’t able to achieve the body that I was dying to have. Seriously, I did really regret the fact that I bought this product. All these promises like dropping the unwanted weight? For three months, I really waited patiently and I just lost around 5 lbs. I don’t think that it was significant at all. How great was that? For me, this product is actually useless. And to make matters worse! It has been difficult for me to sleep ever since I started using this product. So regarding the antioxidants and other so-called benefits? Don’t ever believe on these things anymore. I just really wasted my money. All in all, I don’t really like this one and I?ll never recommend this. So take it from experience and avoid this product for Christ sake. Based on my experience, I must say that Goji Active was just okay. Well, your review is truly correct because it really triggered my sleeplessness. I should’ve seen this before because I’m totally suffering now. Currently, I’m doing everything to put my sleeping patterns in proper order again. But regarding the effects, I lost some weight. I just had to stop using it because of my insomnia. As an Asian who basically grew up in the States, I am always conscious about my body figure. Now that I am a mother of three, I worry about shedding my extra pounds. My doctor told me that I am in good shape and I could take natural diet pills that are not harmful to my body. That why I tried Goji Active. The pill had some effect in my body but it took me for quite some time. I thought I would lose the weight instantly, but I have to exercise to help myself burn the excess fats. The change in my body was not really quick and easy. It took me about a month and a half to notice the difference. But at least it did work out. I guess for those who are sensitive to caffeine, I would rather let you ingest a non-caffeine pill to be safe.